Welcome to Woofgang! We here at Woofgang strive to produce intelligent, hard working, and conformationally correct companions. Our handsome pups have exceptional personalities and good temperaments. We raise them in our house with the family, so our pups are well socialized and treated as members of our family until welcomed into yours. Please take some time to meet our canine family. We are very proud of the dogs we have and even prouder of the fine puppies they have produced. Please feel free to contact us here at Woofgang. We always welcome your inquiries. Woofgang Jig had a beautiful litter and there are several reservations available for both sexes. ​Please go to our Planned Litters JRT Page or the Available Puppies Page or contact us for more information! We have one pick left for a female puppy from our Danni x Striker litter born April 5th. We are really looking forward to seeing how these pups develop. They should be outstanding companions and hunting partners. She will be ready to go at the end of May. If you're interested in a female puppy from this litter, please contact us. 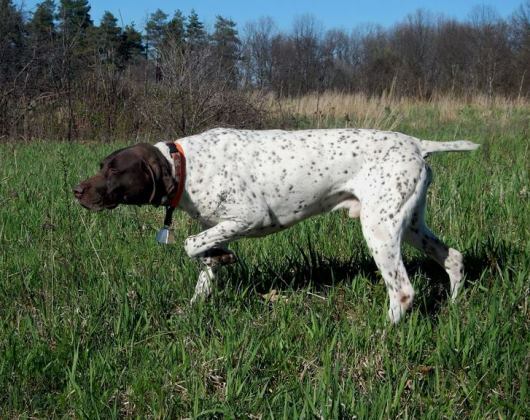 We've posted our planned GSP litters for 2019 - go to our Planned Litters GSP page for more information. Caillie took winners for a 4 point major at the Ingham County Kennel Club show in East Lansing on Sunday! Great excitement for her first weekend of shows! Way to go Caillie!! Caillie had a great showing at the Indy WInter Classic dog shows! On Thursday, she went winners, on Friday she went winners, best of winners and best opposite (over several specials) for a 4 point major! On Sunday she went winners and best of winners for a 3 point major! She' s just 2 points short of her championship. Great work Caillie!!! wins in her puppy classes. Great fun! Misty completed her first leg on her Junior Hunter title at the Southern Michigan Weimaraner Club hunt test at Highland. Nice work! Misty completed legs two and three at the Irish Setter and NODROG hunt tests this weekend! For her run with the NODROG Club, she received a score of 10 for Hunting, Pointing and Bird Finding. We were very pleased! Misty finished up her Junior Hunter title on Sunday! you to visit these club websites. The sites are filled with useful information about both of these interesting, intelligent and hard working breeds.